Genes may play a crucial role in the development, progress and painful nature of osteoarthritis. But research suggests their effect may be different for different people. Once a patient has been diagnosed with osteoarthritis, often the first question is how it developed. In many cases, there is an obvious cause such as a previous fracture that involved the cartilage surface or, for instance an anterior cruciate ligament (ACL) rupture. There are a host of other known risk factors including age, previous surgery, obesity, gender (post-menopausal females), occupation, and bone shape (morphology), there remains many situations where the apparent cause is unexplained or minimally explained by previous history. This leads almost inevitably to the question – was osteoarthritis ‘written in my genes’? We are far from having a complete answer to that question at this stage of osteoarthritis research. But we are beginning to get an understanding of the genetic contribution to osteoarthritis as well as getting an insight into potential genes that are associated with the disease process. It is likely that many genes will be implicated in both the occurrence and progression of osteoarthritis, and these genes will interact with each patient’s unique environment to differing effect. Assessing familial contribution to osteoarthritis can be performed by several different study types. The simplest of these studies the extent to which osteoarthritis runs within families – and in particular what is termed sibling recurrence risk – the relative risk for osteoarthritis with a sibling already affected by osteoarthritis. Studies to date indicate a 2.1-to-2.3 times risk of knee osteoarthritis if a sibling has the disease, and a 4.3-to-5 times risk for evidence of hip osteoarthritis, based on x-ray reports. While important starting points, these studies can’t differentiate between genetic influences and shared environmental or lifestyle influences, and so can’t completely answer the question of genetic influence. Twin studies form an ideal method of studying genetic influence on osteoarthritis – via comparison of identical to non-identical twins we can estimate the percentage contribution of genes to osteoarthritis (this is known as “heritability”). These studies are valuable because identical twins share 100% of genes, and non-identical twins share 50% of genes. Data from twin studies to date have indicated heritability of about 40% in knee osteoarthritis, while hip osteoarthritis is considered to have a much higher genetic contribution (60%). It is likely there will be considerable variation in genetic contribution across different joints – for instance in ankle osteoarthritis most cases are post-traumatic and as such will have a low genetic contribution. Finding genes across the human genome that are associated with osteoarthritis(or any common disease) is like to finding a needle in a haystack. There are many methods available to researchers, and among the most common are large scale genome-wide association studies (GWAS) – the research equivalent of throwing a 20 kilometre-long fishing-net off the back of a trawler and seeing what fish we land in the process. This requires large numbers of participants (and considerable expense) to be powerful enough to detect areas of the human genome associated with osteoarthritis. 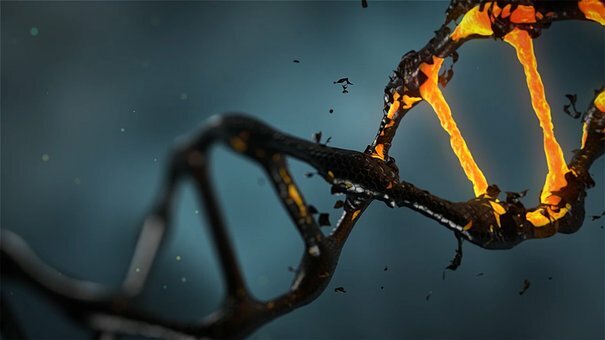 However, with researchers from several fields pooling expertise and resources – certain areas of the genome have been identified that may lead to better understanding and potentially new therapies for osteoarthritis. Genes involved in cartilage binding, cartilage metabolism, immune system modulation and nerve cell migration, are among the best studied to date in osteoarthritis research, although there are many more. Some genome areas that showing up strongly in one population have failed to show up in others, suggesting there may specific effects of gene expression across different genders and ethnic groups. One exciting area of research looks at variations in the MCF2L gene which regulates a molecule called neurotrophin-3 (a nerve growth factor). This may be involved in the expression and regulation of pain in osteoarthritis, but more research will be needed to ascertain its precise role. Generally, much more work is needed to understand how these genes specifically influence osteoarthritis and its progression. Only at that point will we have new therapeutic targets. So, is osteoarthritis all our genes? The evidence so far suggests it’s likely a combination of genetics and environment that leads to osteoarthritis in most circumstances. However, as researchers we eagerly await further studies about specific genes to allow us to better understand the disease process and identify new treatments for patients.